Music fans wanting a little variety with their summer tour package will get that very thing with the POISON "Nothin’ But A Good Time 2018" tour. 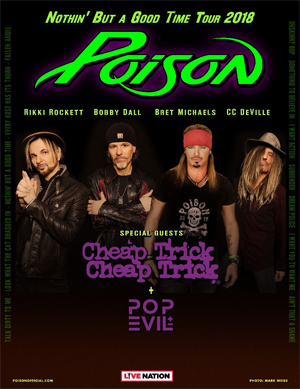 Iconic rock band POISON, with all original members, will be joined by CHEAP TRICK and POP EVIL on its trek across the U.S. this summer. The tour is set to launch May 18 in Irvine, CA at Five Points Amphitheatre. Check out the video below to learn more about the “Poison…Nothin’ But A Good Time 2018” tour.